Just to warn you in advance, I'm going to be harsh in the review that follows because I think this sort of thing is problematic for Christians today. 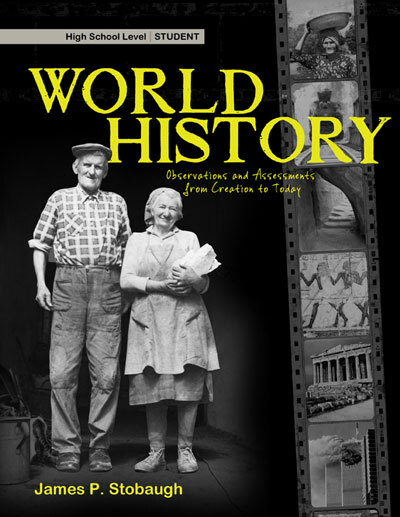 James P. Stobaugh’s textbook for High School students has a great premise, teaching a Biblical/God focused view of history from creation to the present. I think if you believe in God; it’s important to look at history through His eyes and to teach that perspective to your children. I will say that Stobaugh does a decent enough job covering major time periods and events and maybe his intentions were good, but . . . The negatives of this history textbook far outweigh the positives and can be broken down into three major problems: accuracy, sources, and editing. In terms of accuracy, not even secular historians can agree on the exact timelines of some of history’s major events; however often times this textbook doesn’t even line up chronologically with itself. For example, Stobaugh gives a date of the 5th century B.C. for Herodotus and says, “Herodotus wrote The Histories at approximately the same time that Moses was writing the Pentateuch-the first five books of the Bible” (p 80). However only a few chapters ahead of this, he gives the dates of 630-561 B.C. for King Nebuchadnezzar, who “attacked Judah, captured Jerusalem, and deported important citizens to Babylon” (p 24). Apparently Moses and the Pentateuch came a century after Daniel and the exile in Babylon, confusing right? Sadly, I can’t say I’m too surprised that there are strange chronological issues like this when the book frequently cites impressive scholarly sources like www.history101.net and The Complete Idiots Guide to World History. Add this complete lack of academic integrity to the frequent editorial errors like calling the sections of the Roman armies “legends” instead of “legions” on page 94, and you have what appears to be a High School textbook written by high school students, who probably wouldn’t even notice the errors because they wouldn’t know any better. Books like this only serve to perpetuate the notion that Christians who believe in God and creation are nothing but ignorant country bumpkins. The authors have done a disservice to their younger brothers and sisters in Christ and to their God and King by not putting in the effort to deliver a quality and factual textbook all while making the claim to glorify the One who wrote history. Do all things as unto God in this case means putting in the hard academic work of verifying your information, going to a library or two, and combing the text until all the errors are gone. Honestly, I was truly looking forward to reading this set of books, but now I’m dreading reading the British History and American History texts sitting on my shelf. I cannot in good conscience recommend buying this book and giving it to your children, at least not if you intend on sending them to college at any point. I received this book from the publisher for review. Obviously all opinions are my own. Ouch! Mr. Porter, your insightful comments about mixed up dates are duly noted. With no umbridge--indeed with sincere gratefulness--I accept your criticism and intend to make appropriate changes in new editions. Thank you! I wish I would have found this blog before now...at the same time, Mr. Porter, my brother in Christ, your rsuggestion that my mistakes in editing and scholarship reflect a pretentious mendacity are, I hope, ungenerous--I thought I was bringing academic acumen that was enriching the Christian cause and advancing the Kingdom. If I have failed, please forgive me. I shall try harder! Again, though, I accept your criticism and shall make amends. James P. Stobaugh, jpstobaugh@post.harvard.edu. I think that your review is very harsh and uncharitable. Mr. Stobaugh is a very well educated man-far from the country bumpkin you mention in your review. Every history text has mistakes and many often cite less than worthy resources. I don't think the cons that you mention are worthy of your scathing assessment. Let me know when you find the perfect history textbook. I hope you are as diligent to search out mistakes as you have been with Mr. Stobaugh's books. I really don't have an axe to grind here. I prefer using living books for the bulk of our history studies so I am not out to defend any history textbook in particular. I just found your review a bit over the top.